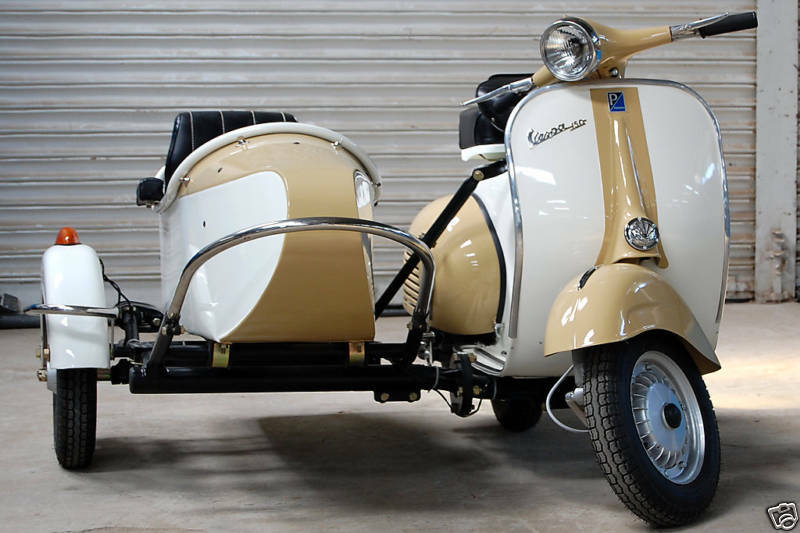 Great sidecar project! Looks very nice. 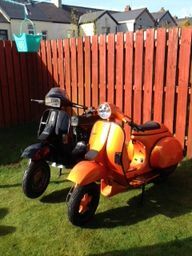 I have a Stella with a sidecar that I am tweaking and fixing. 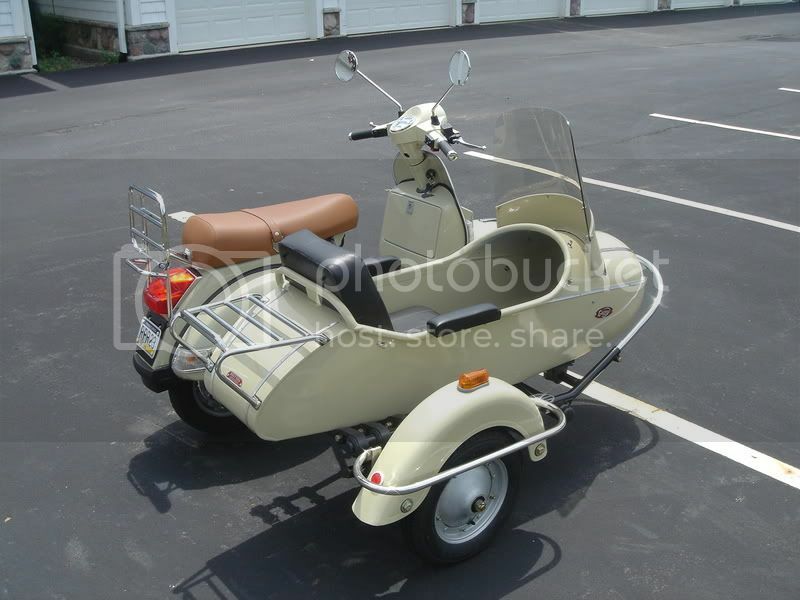 Where does one get the rubber parts for the Vespa? I have looked at quite a few parts outlets and have not found the little rubber pieces for the mirrors? 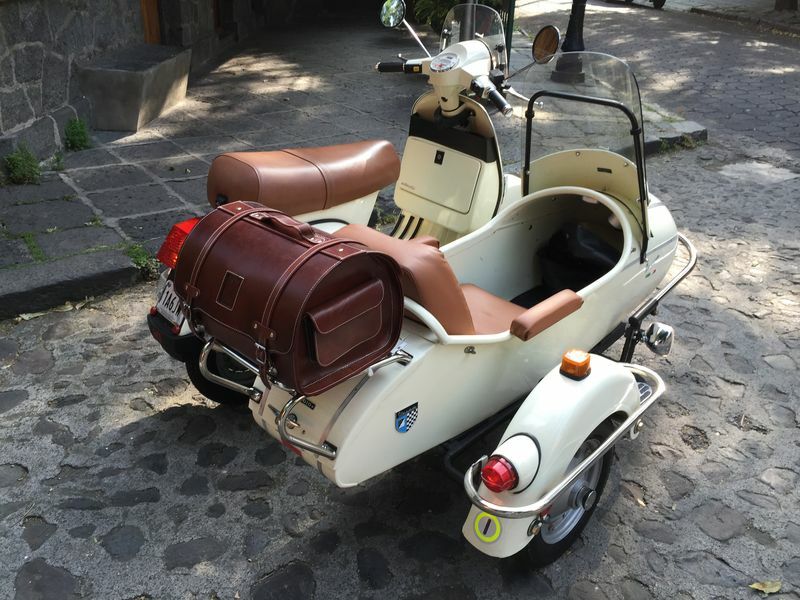 Vespa Scooter parts are available world wide. 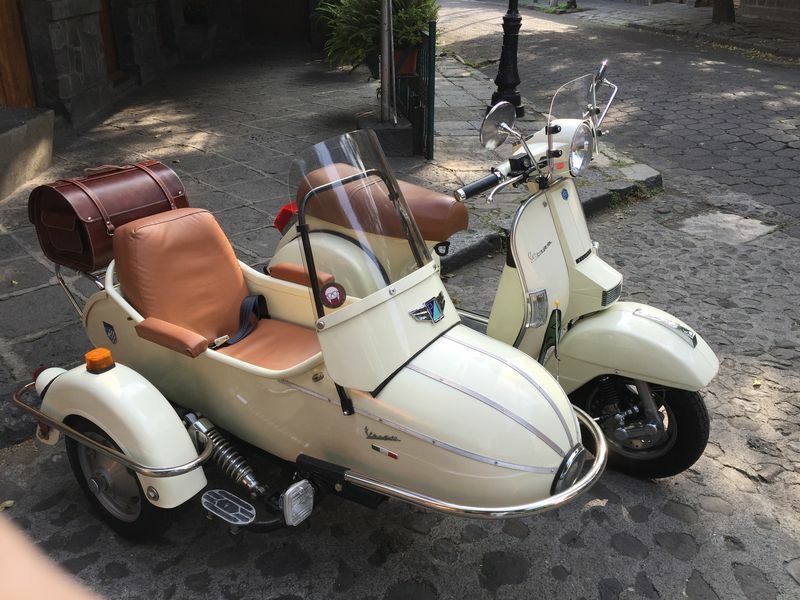 A Google search will yield lots of hits for Vespa parts or you can do as I do and try to support your local Vespa dealers with parts orders. 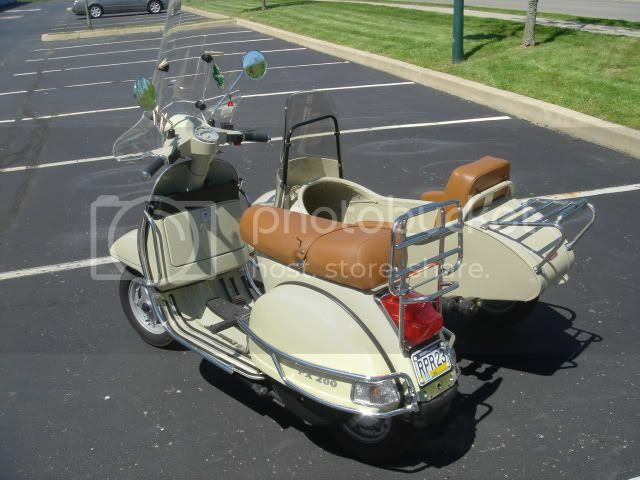 My first source is Pittsburgh Vespa. To name a few others I have used for older PX items. 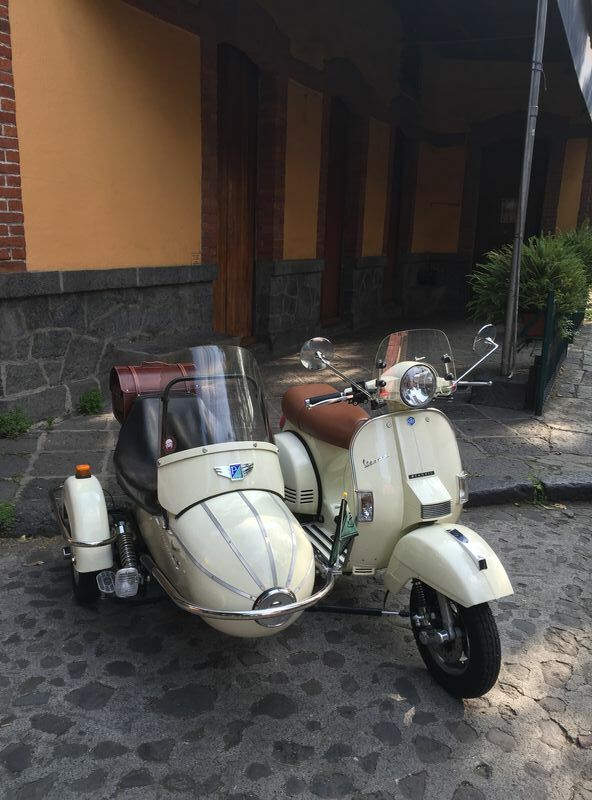 What make sidecar do you have? I just installed a Cozy Sidecar on my 2006 PX200. I used a hydraulic damper instead of the Cozy supplied friction damper. It works very well. No shimmy at all. My name is David, from Los Angeles, CA. 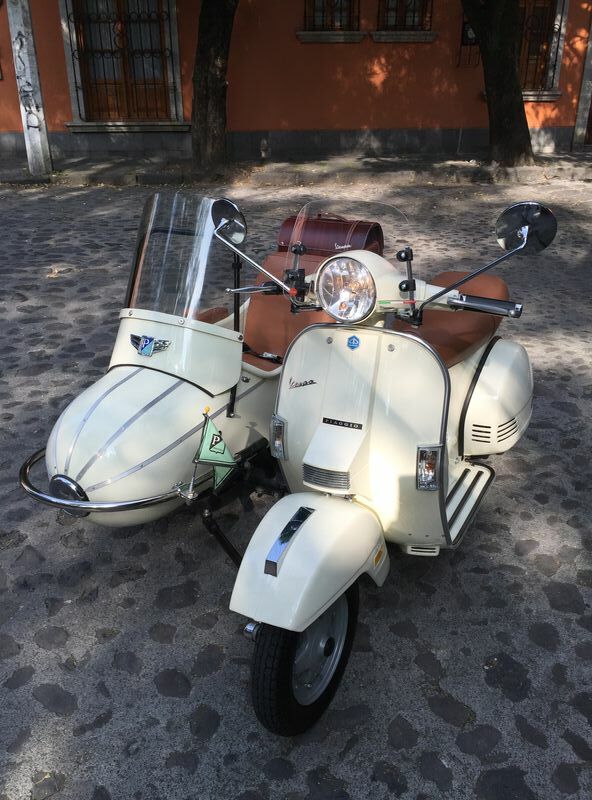 I just bought a Vespa VBB with a sidecar. It ride very bad. Because of the steering wobles and shakes so much. I saw your Hydraulic steering damper project and asking your experty help. 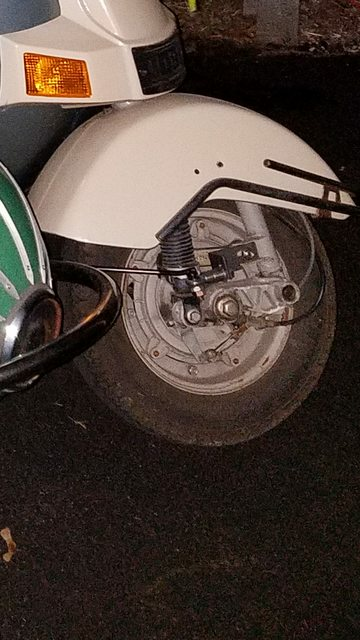 Any suggestion where to drill the hole for mounting the tied rod end ( steering hydraulic stabilizer ) on my Vespa VBB-150. If I decide to do your set-up. I am not familiar with the front wheel geometry on your scooter. Maybe a picture of your front wheel assembly would help. can be damped with a hydraulic damper. 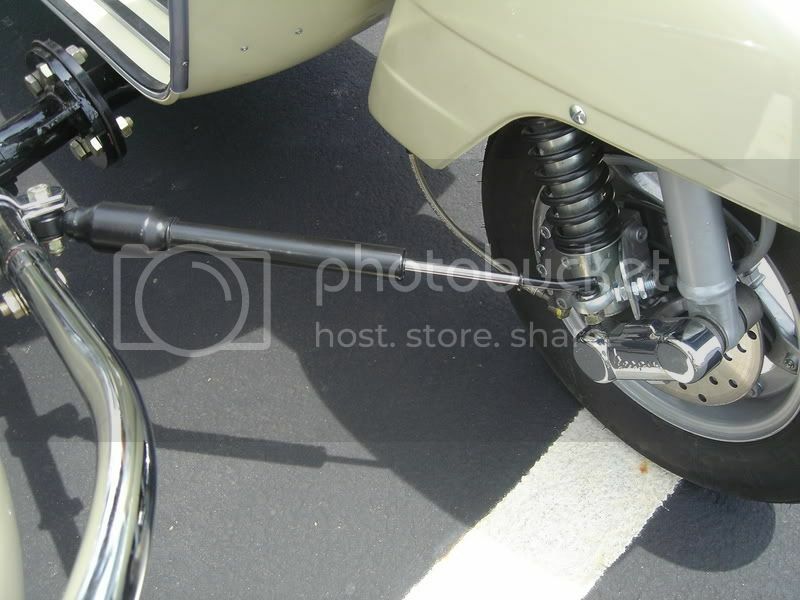 Also, many scooters with side cars use a friction type damper on the steering column. 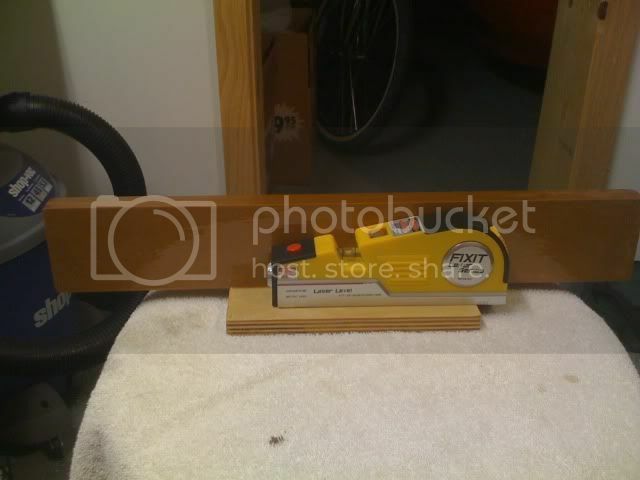 Here is a link to a website that has a picture of the friction damper. However, the hydraulic damper is much more effective in my opinion. What about drilling holes to the front fender ???? I will try to get you a close-up of the front wheel picture tonight. Thank-you so much for your quick responsed. I don't believe the fender will be rigid enough. Unfortunately, the photo doesn't show the suspension side of your front wheel. But, it looks very similar to my PX 200. The thread shows the bracket I made to mount the damper to the front wheel assembly. Maybe another picture of the other side of the front wheel will show any difference from the PX 200 wheel assembly. 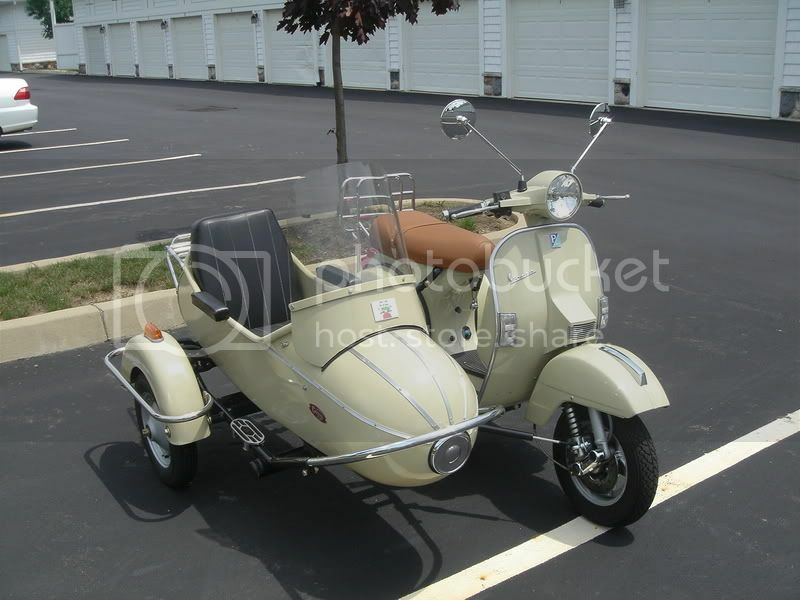 I painted my side car to match the 2006 PX200 Tan color. I had the PX200 color computer analyzed. The computer picked Deletion 2000 PPG, DBC26459 Khaki. Good luck with the paint job. I finally finished my sidecar upholstering to match the PX200 tan saddle. I am pleased with the upholstery color match and I think it looks way better now with the tan sidecar seat. Also put a wind screen on the PX200. 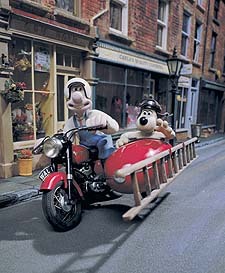 Now, on to mounting the Air Soft machine gun onto the sidecar. Never saw Fire Equipment like that before. Must be a UK thing? That is simply a gorgeous set you've got there. I'd love to have a rig like that some day! You need to do some nice glamour shots in a field or a cute little marketplace or something. You can get the rubber parts here for the mirrors. As well as any vespa shop. BTW, if anyone needs the bracket for the side car, I had a bunch made. PM me you can have them at cost.. I had two Fixit Lasers laying around and built a simple jig to assist with alignment of my PX200 and Cozy sidecar. 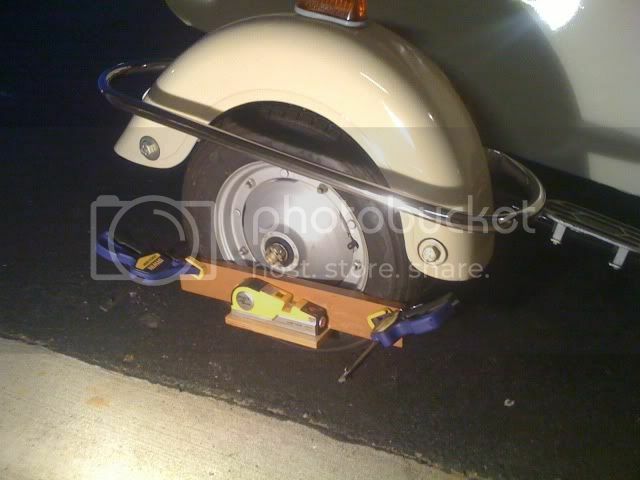 I use Irwin wood clamps to hold the wood fixture to the sidecar and rear scooter wheel. 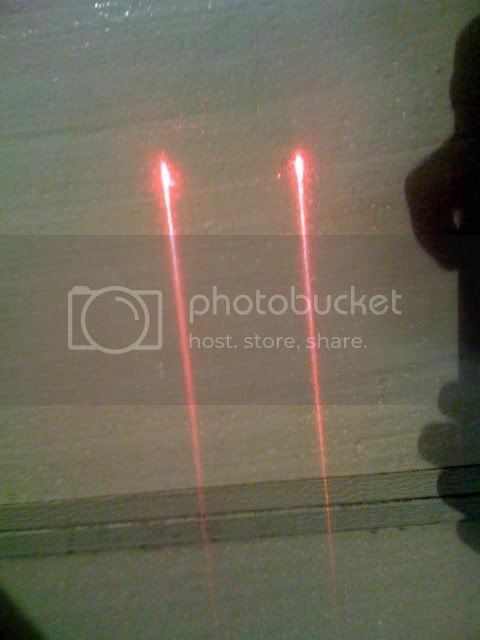 With lasers turned on and pointing at the back side of my garage door, I can adjust the scoot/sidecar geometry with ease. 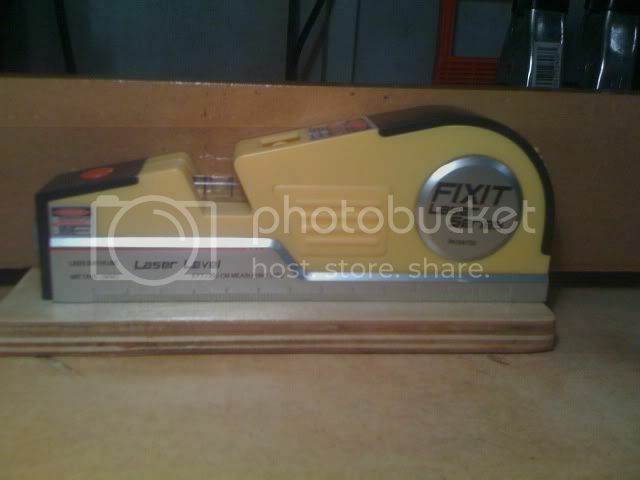 The Fixit Lasers can be bought on eBay for about $7.00 each. I used 3/4" MDF (Med Density Board) for making the jigs. And some You Tube vids would be awesome.I love watching these in action,please pretty please. Have you been in the sidecar whilst moving ? How does it feel ? 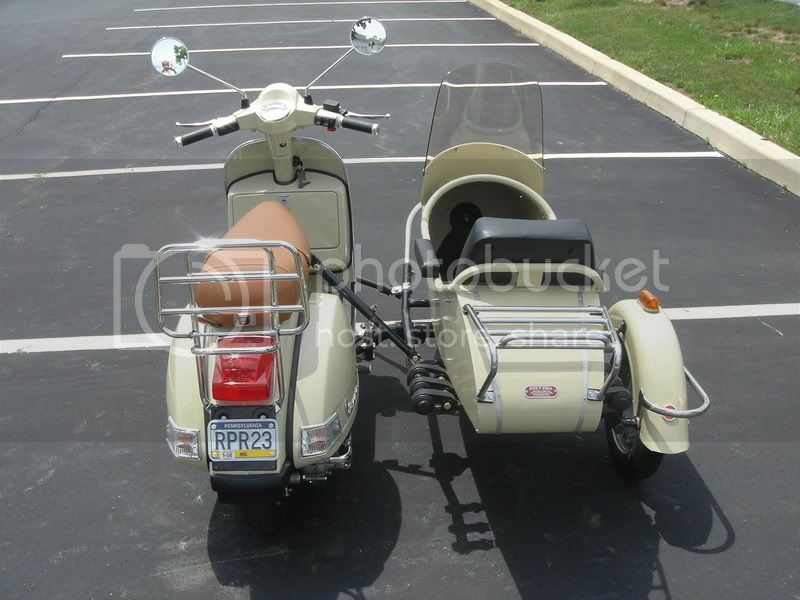 I have had a lot of inquires about the Hydraulic damper I installed on my 2006 Vespa PX200 and Cozy Sidecar. 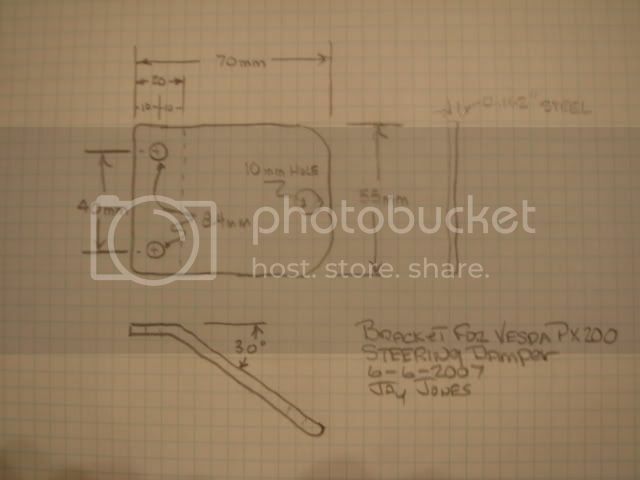 I made a bracket from 5/32" thick steel plate measuring 55mm x 70mm. The holes for mounting to the Vespa wheel assembly is on 40mm centers and 8.4 mm in diameter. I bent the plate about 30 degrees to allow for the tie rod end mounting. I drilled a 10mm hole in the steel plate for the shank of the tie rod end. The only thing I didn't mention was the metric nuts that holds the bracket to the tie rod end shank. They can be purchased at most any hardware store or from McMaster-Car. Get 10mm nut with 1.50 threads/mm. I used this Hydraulic damper instead of the friction damper that came with the Cozy sidecar. 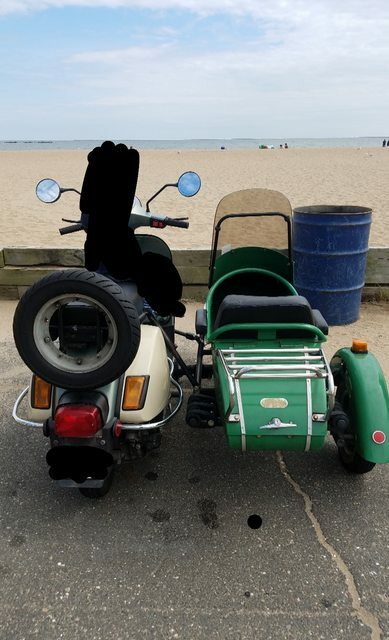 I didn't want to screw up the Scoot's head set should I want to remove the sidecar. 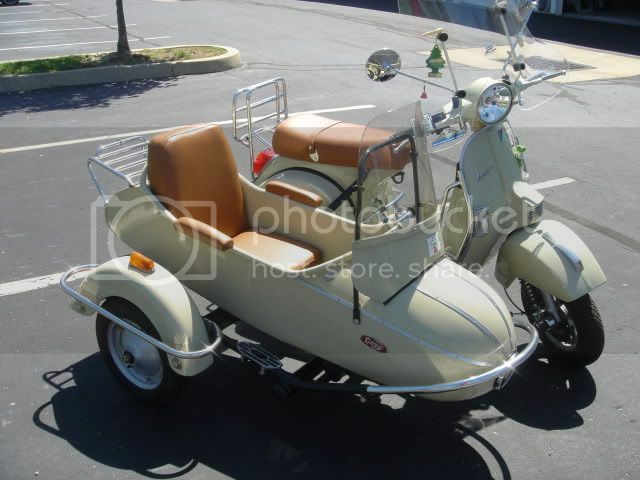 I do have a question though on those that have installed this sidecar on their vespa PX150 or similar. Are you able to "slide" the sidecar further away using the main tube that you twist for toe adjustment? Is there a spec'd distance for that? I purchased my bajaj with the sidecar already installed and it feels very close to the scooter and they had to bash the engine cover in so that the crossbar that attached to the underseat bracket would reach. I know it isn't necessarily apples to applies but figured I'd ask. I reached out to scooterworks usa and they said they don't know anything about mounting the sidecar to a Bajaj.